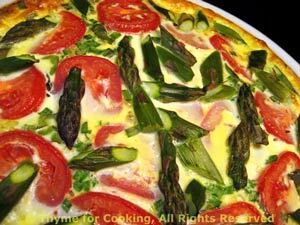 Easy Dinner: Asparagus and Chevre (Goat Cheese) Quiche, Weekly Menu Plan. The quiche is chock-a-block with vegetables, making a substantial dinner with very little meat... And very healthy... I know tomatoes aren't in season yet, but the supermarket ones are fine for this. Cook the rice earlier if you can. This would also make a lovely brunch dish. The variations on quiche are almost infinite. Because I have this one so packed full of good foods, it takes a bit longer to bake then usual. I had it in the oven for 40 minutes. The center should be dry in appearance and only slightly 'jiggly' when done. My brown rice cooks in 15 minutes... If yours take longer, make it ahead of time, or substitute Basmati or Arborio. Cook brown rice in stock according to package directions. Can be done ahead or the day before. If rice is just cooked, spread it on a plate to cool for 5 minutes before adding to egg. Oil a 9" (22 cm) pie or quiche plate. Add 1/4 cup of the cheese and the cooked rice. Mix well. Pat into the quiche plate, working it up the sides as best you can. Bake in 400F (200C) oven for 10 minutes. Trim asparagus, snapping off tough ends. Cut into 1" (2.5cm) lengths. Heat water in a saucepan over high heat. When boiling, add asparagus and blanch for 3 minutes. Drain and refresh under cold water. Tear Prosciutto into large pieces. In medium bowl whisk 3 eggs well. Add milk and whisk to combine. Lay Prosciutto evenly over the bottom of the baked crust. Lay the goat cheese on top. Lay the tomatoes on top of the herbs. Note: I put the quiche/pie plate on a pizza pan before pouring the egg/milk over. Makes it easier to get into the oven and catches any drips and spills - saving oven clean-up. With your fingers, pull the stem end and leaves off. Cut in half or quarters if very large. Combine vinegar and sugar in medium bowl. 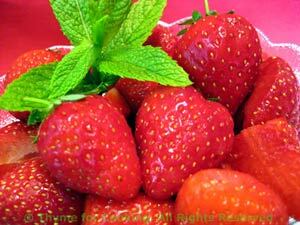 Add strawberries and toss to coat. Refrigerate 15 - 30 minutes.